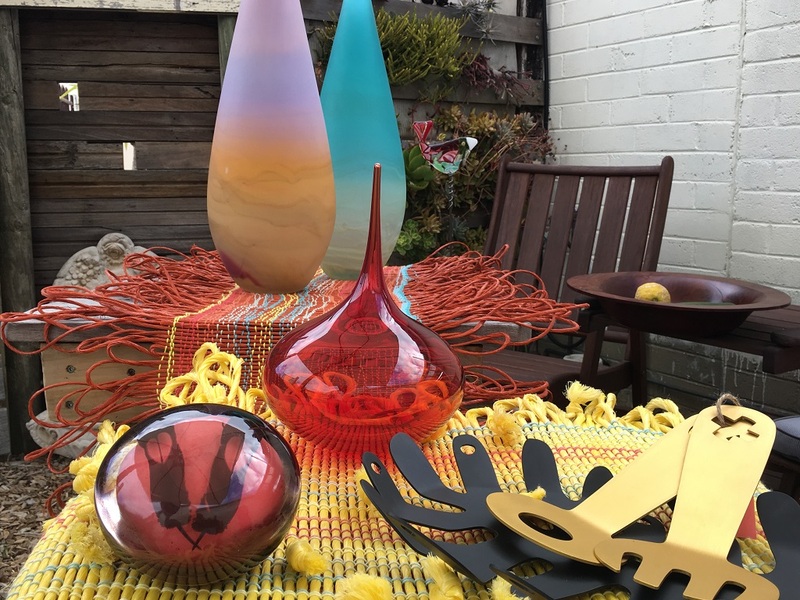 Dressing up the table – Weavings by Kenita Williamson, Squink bowl in black and gold salad servers, Large cherry red Lucky Drop by Llewelyn Ash, Sunset Sunrise and Sandbar Blue Sky vessels by Llewelyn Ash, Wooden Bowls by Jonny Gloyne, various, Mosaic glass bird on stick by Anne Morrison, for garden beds and patio pots, various sizes. When the festive season rolls around, we all want to add a little cheer to our homes, but sometimes it’s the day-to-day stuff that keeps us from doing anything at all. With busy lives and so many demands on our time, we can find ourselves in the week before Christmas still wondering whether we’ll even manage a tree. If this is where your mind has been lately, you certainly aren’t alone. We get it. So we thought we’d challenge ourselves to come up with some fun ways to use the gorgeous things in the gallery to add that little bit of festive cheer around your home. Maybe you don’t “do” tinsel and baubles? Maybe you just can’t stand how everything christmassy seems to look the same these days? Or perhaps you can’t imagine having the energy to take it all down and put it away again when the celebrations are over? No problem. We’ve come up with some fun ideas that can quite literally stay right where they are, and continue to look gorgeous right through the year. Some can even go from stunning decor to the perfect gift on Christmas morning! A gorgeous way to attract attention around the Christmas table. The yellow hanging “Get Knotted” has sold since we took this photo. Be quick! Toss a few shiny red apples or some baubles and pine cones in this eye-catching bowl for a little festive cheer. Or you could use it as a base for a gorgeous salad bowl and bling it up with the shiny gold servers. Sometimes all it takes is a splash of red to turn your December from hum-drum to very-merry! Spoil yourself or someone special with this one and you’ll never want to stop looking at it. If your Christmas holiday is more about lazy days at the beach and long slow Kangaroo Island sunsets, you might want to dress things up with a little less of the red and green. These amazing pieces are sure to help you do it! A very Kangaroo Island way to add that splash of red to your festive decor. This striking black and red paperweight features screen printed Glossy Black Cockatoo feathers floating in the glass. Perfect for bird lovers and art lovers alike. Exclusive to Fine Art Kangaroo Island. A portion of each sale donated to the Glossy Black Recovery Program. What could be more beautiful than a stunning wooden bowl brimming with treats or treasures to remind you it’s Christmas? And we know you can find a thousand reasons to never put it away. Literally have no more than five minutes to bring some Christmas into the picture before guests start arriving? We have you covered. Grab a handful of these gorgeous coloured glass birds. All you have to do is poke the stick in a pot and voila! Christmas in seconds. You’re welcome. 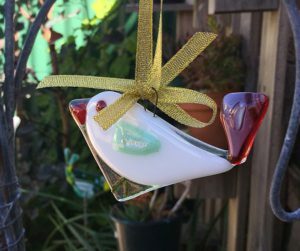 Hanging glass birds by Anne Morrison – perfect for dressing up the tree. Need a little more Christmas? No time to decorate a tree? Well that’s an easy fix too. 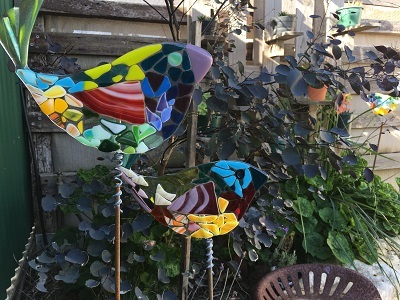 While you’re picking up those glass birds on a stick to dress up your patio for the big day, add a few Hanging Birds, slumped glass tree decorations by Anne Morrison to your purchase. At just $25 they’re great value. It will take no time at all add these little beauties to your tree and completely switch up your Christmas decor. Maybe you’re just not feeling the season unless there’s a little shiny gold going on? 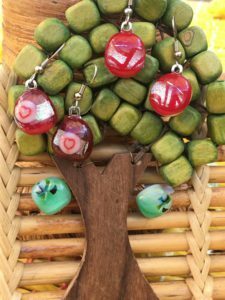 Take a peek at these gorgeous Ornamental Tree Decorations by Gay de Mather, various natural materials, copper wire and glass beads, $25. These are just a sample of what is available, but call in soon. Stocks are getting low. So you see, it really is possible to dress up your home for Christmas in minutes and nobody else need know how little time or effort it took. You also have the option of going just as festive as you want, while keeping it truly unique. You can add a little festive sparkle so easily with all these pieces. You never have to worry about burying your home in another mass-produced cookie-cutter display, and your friends will be dazzled by your seasonal flair. Grab some gorgeous Kangaroo Island Art Jewellery from the Bling It On exhibition and turn it into gorgeous home decor! Ever thought about switching up your Christmas decor by turning the beautiful things in your life to double duty? We took a fresh look at some of the stunning jewellery pieces in the gallery and look what we came up with! Just a tiny sample of the incredible range of glass jewellery on offer right now from Anne Morrison. As a self-confessed glass addict, Anne is always finding new ways to take our breath away with each creation. 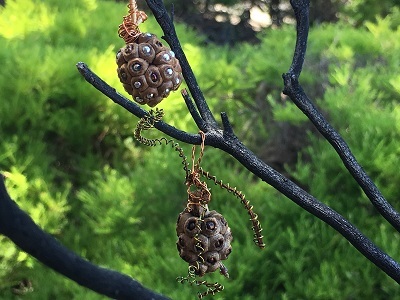 We thought they were perfect little baubles to add to this eye-catching Wooden Tree Pendant, by Patsy Verwaal, created from found recycled components, $49. A true statement piece, who knew it could double as the perfect Christmas backdrop? The only thing missing is the partridge. It could also be a pretty awesome way to keep a few tiny extra gifts on hand for that unexpected visit from a friend you didn’t quite get to buy for. Tell them to go ahead and choose the pair they like best and treat yourself with what’s left for New Year partying! Imagine waking up Christmas morning to find the most gorgeous ornament on the tree is actually a very precious gift, just for you. 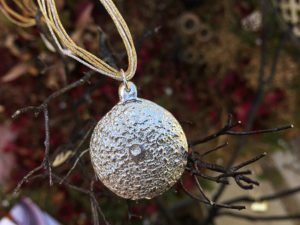 That’s the wonderful feeling you could give someone when you add this gorgeous piece to the Christmas baubles on your tree. Available for sale in our online store. Sometimes the easiest way to keep something a surprise is to hide it in plain sight. Imagine the look on her face when you tell her! 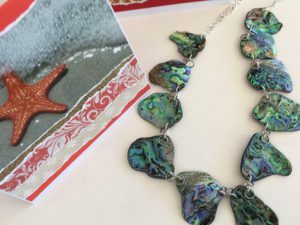 And while you’re hiding precious gifts in the greenery, cast your eye over the beautiful Simply Paua II, fabricated silver and paua necklace, by Peggy Rismiller at $225. Hang it in the tree and use a special card to deliver a note with details of its hiding place. Original art photography Christmas greeting cards by Ann Lashmar are perfect for the job and available in two sizes, $8 small, $9 large. These quality cards have been a signature of the Gallery since opening in early 2008. Hand made with torn art papers, and original art photographs they are perfect occasional cards. Use them when words cannot quite convey the emotion or as a gift when you are not giving a gift. They also look great framed in contemporary framing. Contact us at Fine Art KI for a framing quote. You can even use them as pretty decorations just to bring a festive touch all over the house. Guests for lunch on Christmas Day? Write a welcome note inside one of these cards and attach a pretty label. Write the name of a guest on each label and wow them all with your festive place cards! Don’t forget to dress yourself up a little for Christmas too. There’s no better way to get in the spirit of the season than adding a little festive touch to your own Christmas outfit. You’ll be surprised how easy it is to put yourself in the mood for a celebration with the perfect accessories. Voyager necklace by Fred Peters, perfectly framed by a Maggie Welz festive silk scarf. 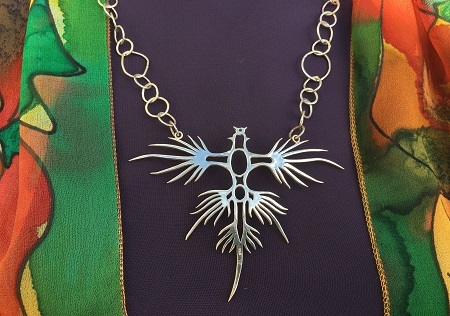 Start out with a stunning Fred Peters pendant like “Voyager”, fabricated and pierced sterling silver, single edition, 10 x 7.5 cm focal on 59 cm hand forged chain. Wrap up your look with “Fine Butterflies” hand painted silk georgette scarf by Maggie Welz, $85. And speaking of wrapping, why not add an extra special touch to a precious gift by wrapping it all up in one of these amazing fluid silk wraps? Two gifts in one. Now that’s Christmas!